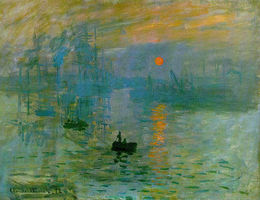 2 Claude Monet is a very famous artist. He was born November 14, 1840, in Paris, France. As a child, he always liked drawing pictures. By the time he was seventeen, he knew what he wanted to do with his life. He said, "I saw what painting could be! From that moment on, my way was clear, my destiny decreed. I would be a painter, no matter what." The fashionable paintings done at the time were usually carefully painted scenes from history. Monet liked to paint outdoors. He liked to paint sunlight and shadows. He found that he needed to work fast to capture the picture he saw. Art critics didn't like his work very much. They said his paintings looked unfinished. 3 Monet had friends who were artists. Many of them experimented with this new style, too. Some of his friends became world-famous artists as well. Renoir, Sisley, Bazille, and Pissarro painted with a similar style to Monet's. Their work was rejected by the Salon. This was an art exhibit held in Paris every year to show off the very best artists and their work. In 1874, Monet and his friends decided they would have an art exhibit of their own. A few critics liked their art, but most did not. One art critic looked at Monet's picture called Impression: Sunrise and scornfully called the group of artists "Impressionists."